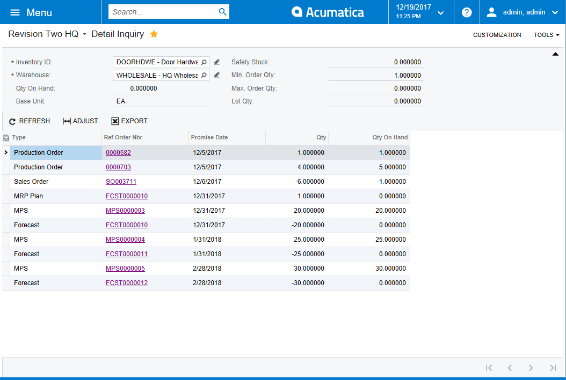 The new 2017 R2 Acumatica Manufacturing Edition* is key to managing the order-to-production-to-cash process. As outlined in previous posts on Acumatica Production Scheduling (Creating a Forecast and Creating a Master Production Schedule) there are a couple of ways to plan production. Those options are not mutually exclusive. Depending on the type of business you run they can be complementary or you can focus on one approach or the other. Forecasting provides demand for the sale of end products. So, if you tend to produce items to meet customer orders the Forecast option may make the most sense. By creating a forecast for the sale of the end items, the system will respond by suggesting that you purchase the raw materials so that you can produce the end items in response to sales orders. Most likely you will want to select the “Dependent” option in the Forecast screen so that new Sales Orders will offset the Forecast not duplicate demands. See our blog post on Acumatica Production Scheduling Software – Creating a Forecast for the steps to create a forecast. The Master Production Schedule (MPS) approach tells the system you want to create a supply of end products whether customer orders materialize for the items or not. If your production cycle time tends to be longer than customers are willing to wait then creating an MPS may better support your production scheduling. See our blog post on Acumatica Production Scheduling Software – Creating a Master Production Schedule for the steps to create an MPS. Most Production Scheduling Software systems have a planning function built in called Manufacturing Resource Planning or MRP. When MRP runs against a Forecast and or an MPS it will generate a list of suggested actions to balance supplies and demands by suggesting the creation of purchase orders and production orders. Production scheduling software systems like the Acumatica Manufacturing Edition can help you better manage your inventory production. MRP systems require constant optimizing them to meet your ever-changing business conditions. We will cover some of these optimization steps in future posts. *JAMS (JAAS Advanced Manufacturing Software) developed by JAAS systems for Acumatica. JAAS Systems has nearly two decades of experience developing feature-rich manufacturing software and manufacturing information systems. Headquartered in Seattle, Washington, Stratotech serves Acumatica customers in the Seattle metropolitan area and northwest region. Stratotech’s expertise allows them to focus on small to mid-sized manufacturing companies who are outgrowing existing systems and looking for lower cost cloud-based alternatives. 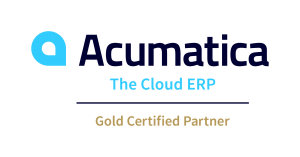 Stratotech is a certified Acumatica cloud ERP and Smartsheet provider. These are leading cloud platforms for collaboration and project management. Stratotech Partners, LLC is an Acumatica Value Added Reseller (VAR) partner. Our experienced consultants provide cloud-based business management software to enable small and mid-sized companies to accelerate their businesses. Acumatica is built on modern cloud and mobile technology and has a unique customer-centric licensing model. Our specialties include business management applications such as Financials, Distribution, CRM, and Project Accounting, on a robust and flexible platform.